Many people pay close attention to how colors impact the design of their homes. It makes sense to be careful not to create an undesirable effect when mixing the colors in your kitchen or the shades of the walls in the living room. Colors add a certain vibrancy to an area making it feel more welcoming and pleasant. It depends on the colors used, but lots of spaces can take advantage of a splash of color. One area in particular that can use a more attractive design is the staircase. While most people think of stairs in a functional sense, their looks matter quite a lot considering how it’s one of the first places that guests notice in your home. It’s clear that you shouldn’t overlook this awesome decorating opportunity. If you feel like the stairs in your home need an updated look, why not try out some of the following painting ideas? With a simple spark of creativity, you can add a more personal touch to completely transform the look of the stairs in your home. Going upstairs has never been more enjoyable. Also a smart thing to do if you have kids is to install a safety net like this. It doesn’t ruin the looks too much and it can help you avoid having your children falling from the top floor. 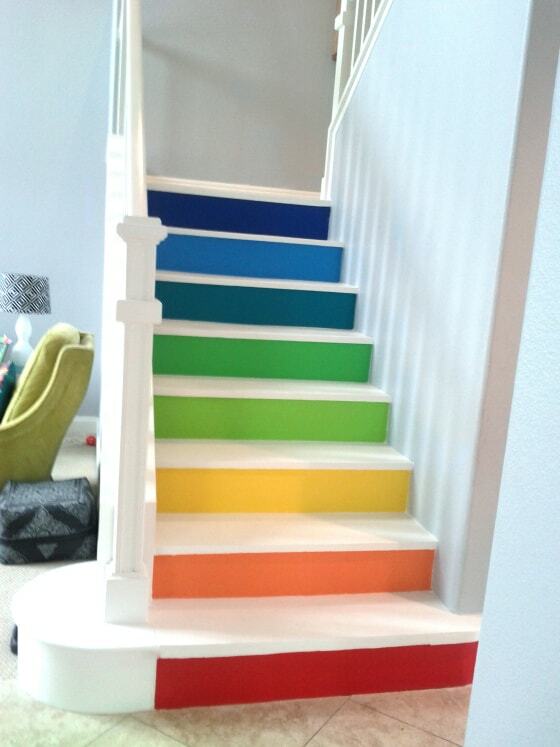 If you want to create a really colorful look for your stairs, check out this DIY project. It transforms plain-looking stairs with a rainbow theme using colorful paints. This is recommended for stairs that are close to the entrance as it allows you to make a great first impression on any guest. 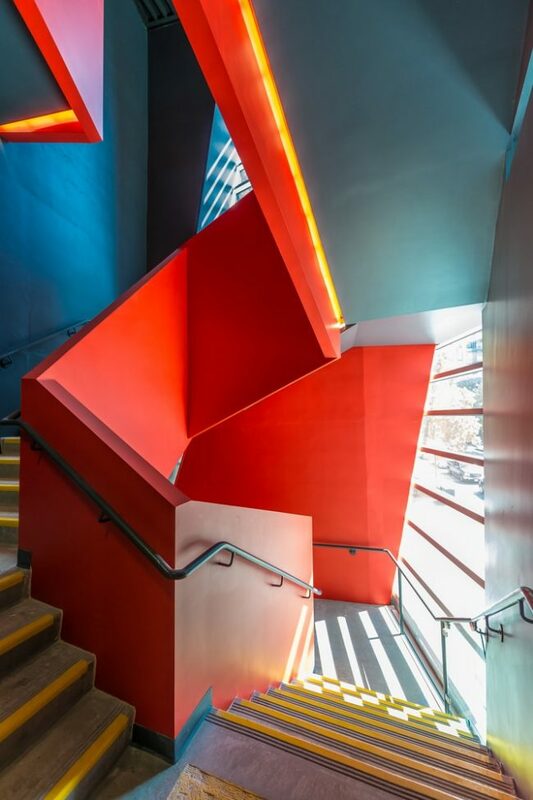 Full-color stairs create a vibrant feeling and can energize the atmosphere in any house. Those who don’t really like the idea of painting the stairs in colorful tones will probably gravitate more toward a monochrome color scheme. In that case, it’s a good idea to add some paint in darker shades which can create a very fitting look for any modern home. 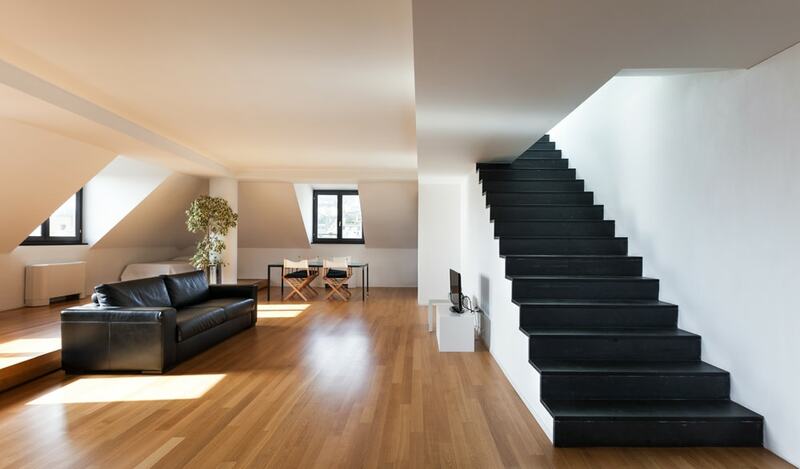 White walls and neutrally-toned furniture can contrast nicely with the moodiness of the black stairs. There’s no need to paint the stairs completely black as you can maintain the wooden top for a brilliant combination of colors. 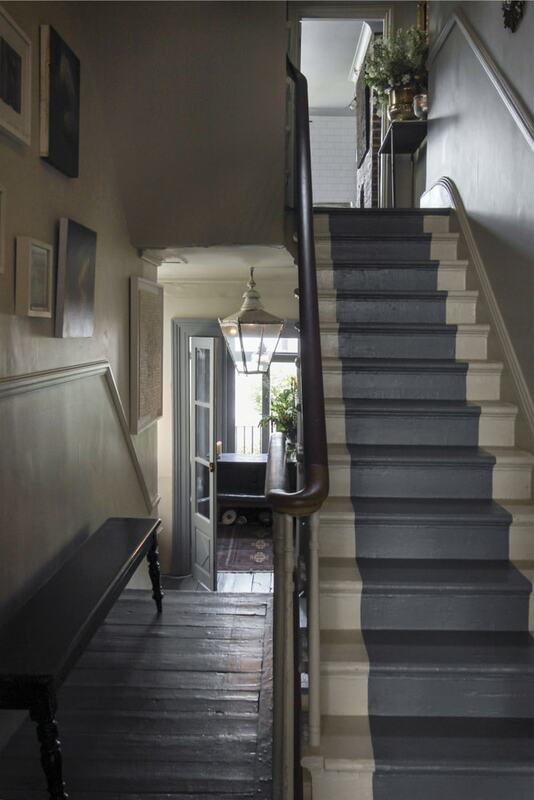 An ingenious way to paint the stairs relies on creating a carpet-like design by painting the staircase creatively. Try to cover only the middle of the stairs with a contrasting tone like navy which pairs nicely with the white tone of the rest of the stairs. The result is a clean and elegant look that’s fitting for both your main stairs or the ones that lead down to the basement. 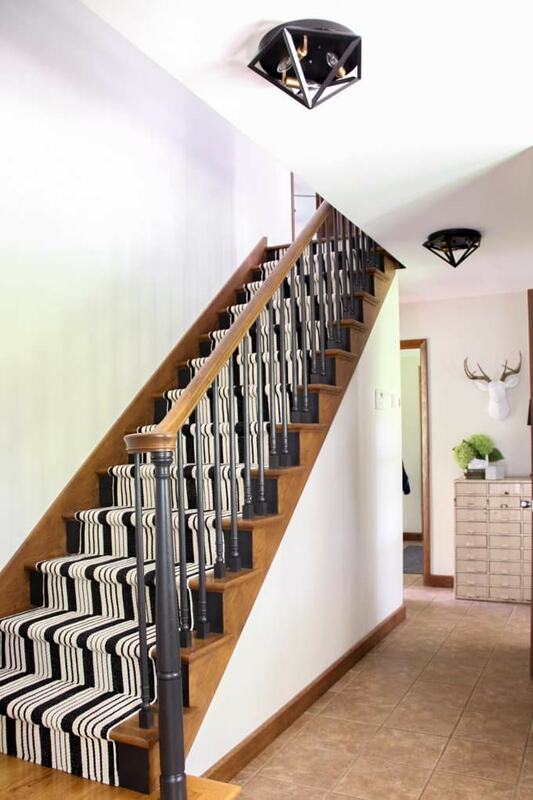 While most people think of painting the stairs to create a bold statement, others might prefer to create a subtler effect. This can be achieved by painting the spindles. 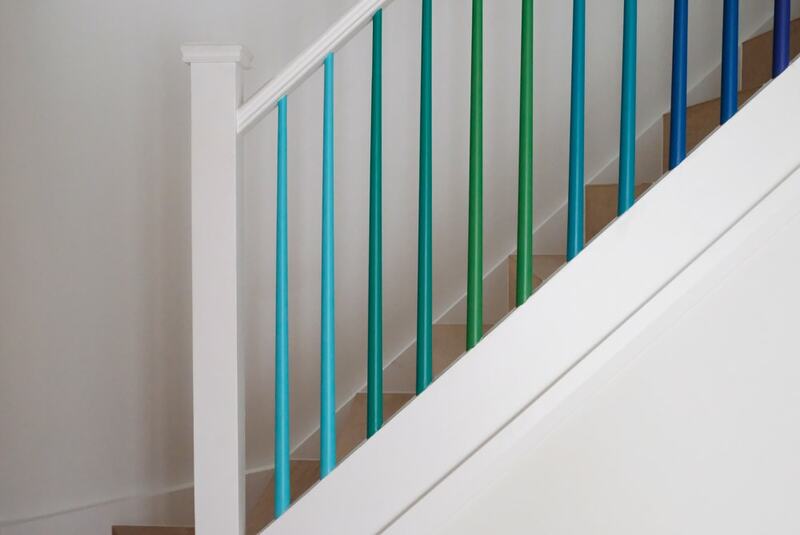 The balusters deserve a colorful treatment but consider sticking just to a single hue if you wish to avoid making a childish look. Painting the spindles is a good solution if you’re satisfied with the overall look of the stairs and just wish to add a finishing touch. Sometimes the classic style of painting can work best for your needs. 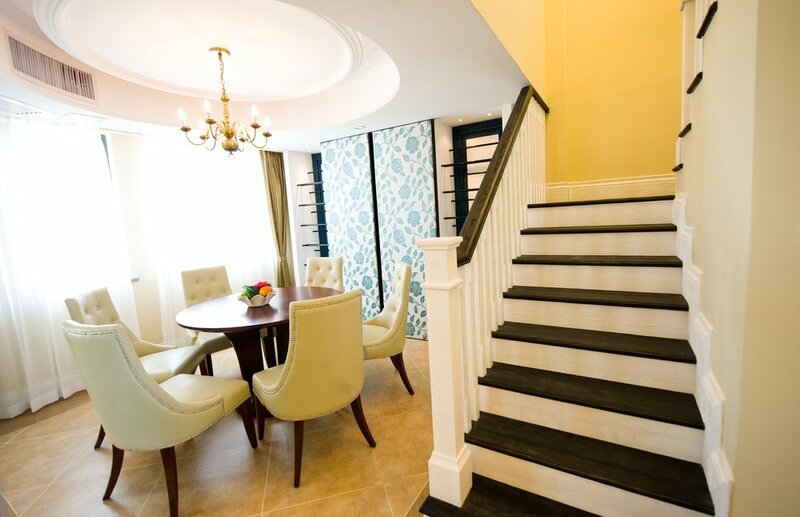 The stairs can make use of a fresh coat of paint to revitalize their look. That’s especially true if we’re talking about old staircases that really need a makeover. Removing the old carpet and preparing the stairs for a painting job requires a bit of effort. With a bit of dedication, you can make the stairs more beautiful than ever. 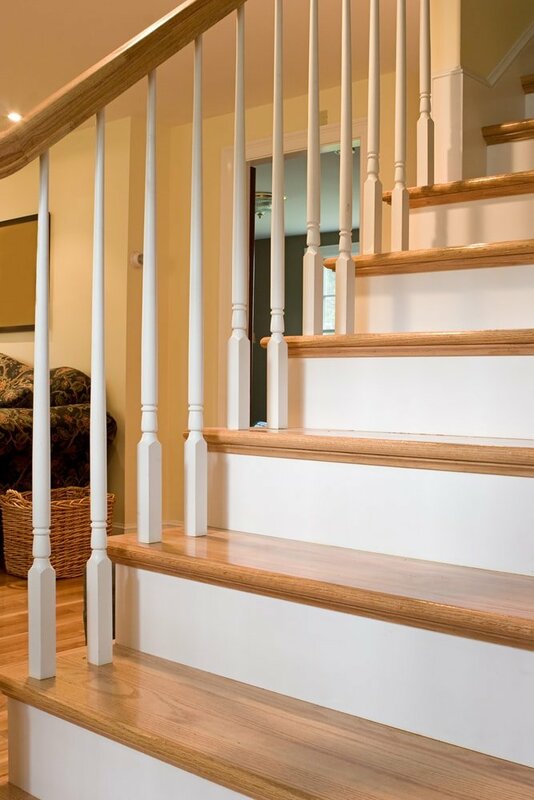 Some polishing work and the right paint colors can make your stairs look brand new. 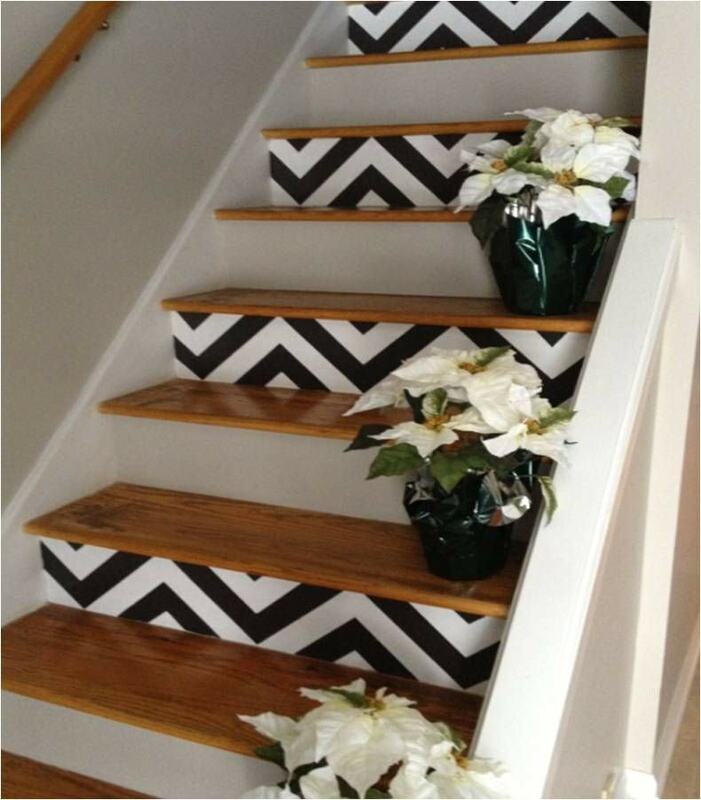 One stunning project that you can try is the DIY chevron stairs painting. The stairs have great potential to allow an artist to showcase their creativity. This project is a great example as it involves painting the stairs with chevron stripes for a touch of geometric design that can match well the style of a modern home. 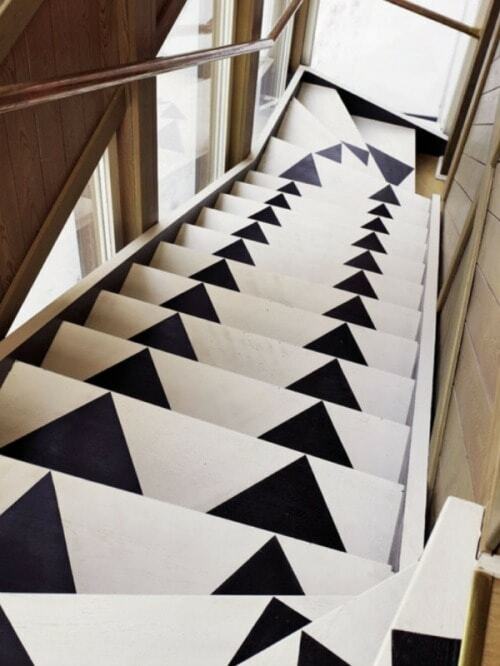 As this pattern can have a strong visual impact, it’s recommended to keep things balanced by applying it only on every other stair. Painting the whole staircase can take a lot of effort and may not achieve the desired effect. Consider painting just the top of the stairs as this can deliver a surprisingly dramatic look by itself. Keep the color scheme monochromatic if you prefer elegance over colorfulness. 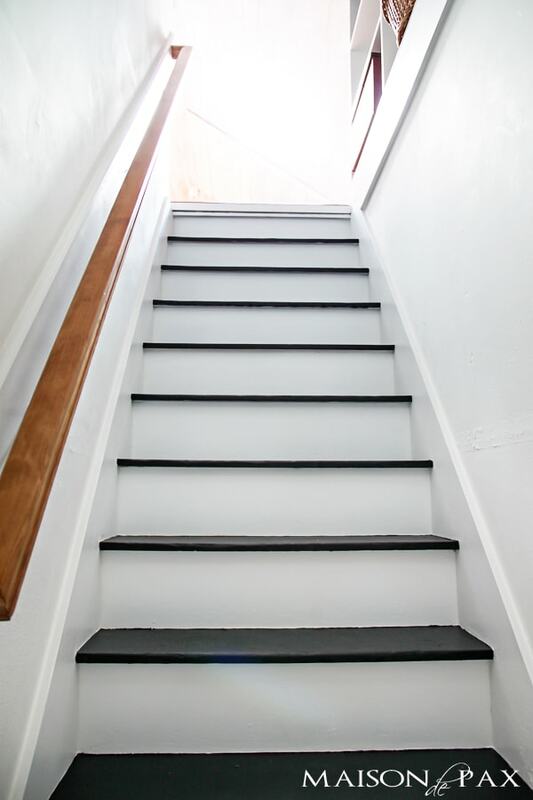 Having the top of the stairs painted black offers excellent contrast against the white bulk of the stairs. 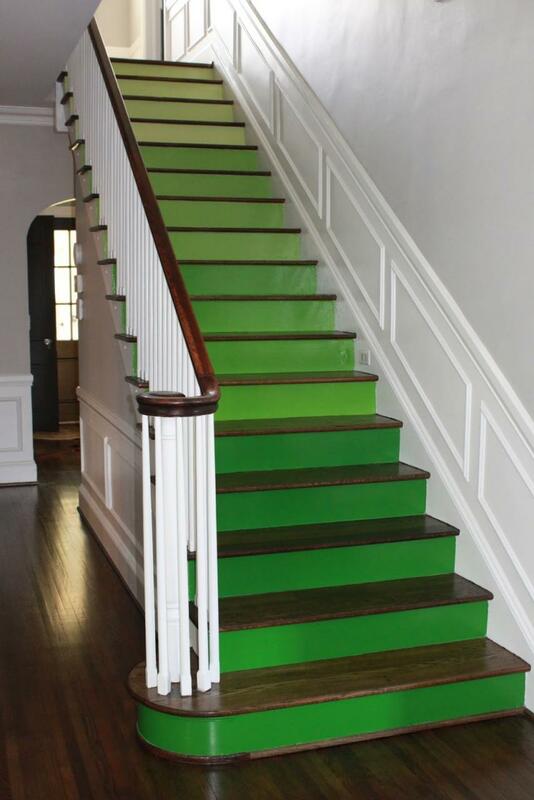 Those who want to add a unique touch to their stairs should go for a more daring shade such as green. Painting the stairs green may not be for everyone, but you can successfully pull off this look if the rest of the color scheme is more subdued. A bit of white molding on the wall can offer an ideal backdrop to the vibrant quality of the green stairs. Choosing ombre for the stairs represents a fantastic design choice, particularly if you wish to bring some extra interest to an otherwise plain area. 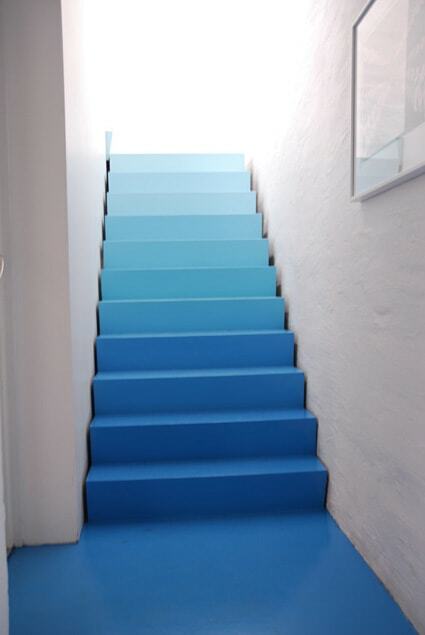 Ombre colors shade nicely into each other and this superb effect can be easily incorporated for the stairs. This is recommended for those who want a whimsical touch without the full commitment required by more complicated designs. Keep in mind that pulling off the ombre look isn’t easy and requires a reliable artistic eye. Old stairs can take some work to get them back into shape. A fresh coat of paint should be an essential part of the makeover process. If you want to get an inspirational idea to paint your own stairs, take a look at this DIY project which makes use of chalk paint. This can be a brilliant choice is as it’s usually more resistant to scratches and chipping. The subtle gray look brings a certain elegance to the table enabling the stairs to become true centerpieces in your home. If you’ve found the perfect rug to use on your stairs, why not add a bit of paint into the mix to create a perfect match? Paint offers an eye-pleasing effect whether we’re talking about carpeted stairs or naked ones. Lots of people prefer adding some texture to the stairs through the integration of a carpet runner. Consider painting the stairs to match the look and to create a solid focal point in your home. 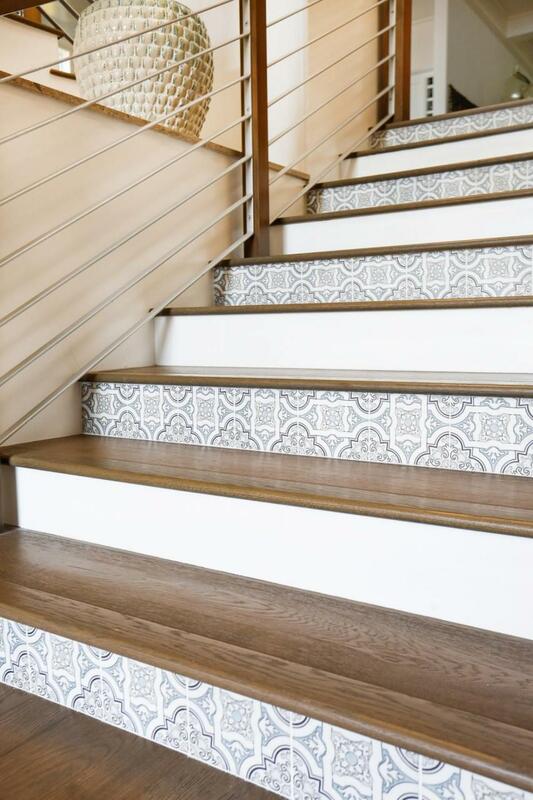 For a more daring look, consider adding some stylish wallpaper to the stairs along a fresh coat of paint. This could be a great budget-friendly solution that’s more achievable compared to making intricate designs yourself. The wallpaper makes the stairs stand out and it’s details like that which add to a more luxurious atmosphere. Geometric patterns fit well with the design of the stairs. This area offers a great opportunity to make use of repeated patterns to add a little spice to an otherwise plain-looking space. Each tread contributes to the overall bold look created by joining together interesting geometric patterns. 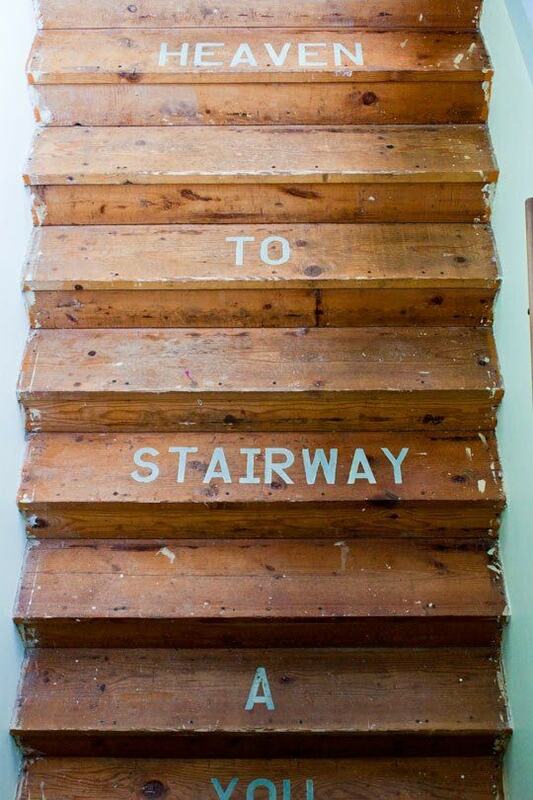 Painting words on the stairs can create a unique effect that’s sure to impress anyone visiting your home. It’s somewhat unexpected to discover a written message as you climb the staircase. This is the kind of creative detail that can make your home more welcoming. Express your mind through inspiring words painted on the stairs. 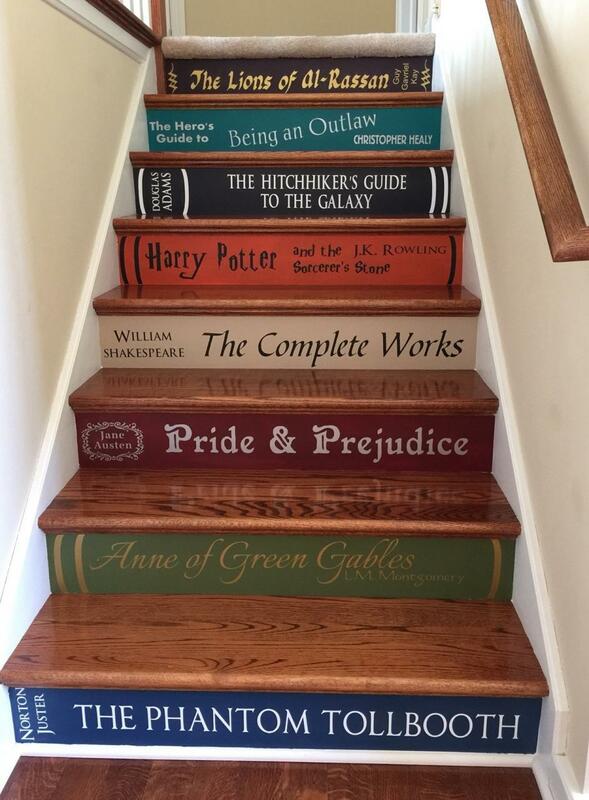 Bookworms should check out this creative way to use decals on stairs. Peel-and-stick decals can be customized to show off your favorite books to anyone climbing the stairs. 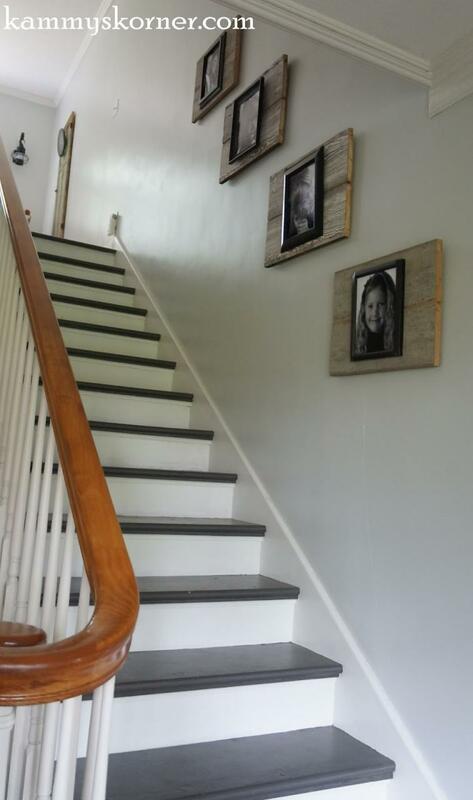 Or you could add another custom design to add a unique twist to the stairs. Whether it’s your favorite quotes or patterns, decals offer great potential to transform the stairs in a creative manner. Keep in mind that you will probably have to paint the risers before applying the decals. 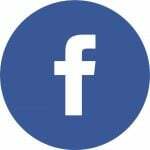 Did you like our article? Don’t forget to spread the word and share it with your friends and family. If you want to paint your ceilings, we have a guide on that as well. Thanks and see you again soon.